Minecraft has accumulated plenty more fans since the Xbox 360 and PS3 editions released and news of some tasty downloadable content for the game is bound to get enthusiasts licking their lips. The new appetizing Xbox 360 and PS4 DLC is hinted as food based content, and a representative from the development team has confirmed work on various upcoming Minecraft DLC. According to a report on Examiner a fan enquired about whether new texture packs will be bracing the console versions of the game anytime soon, and a rep has given us the impression more expansions are indeed in the works. We could be seeing more content in the near future as there has also been talk about the content being food related. This tease went so far as to say this could be called, “the Candy Saga Texture Pack,” and confirmation highlights a confectionery type one DLC, as they believe Candy Saga Texture Pack could be the ideal name for this. However, popular social game Candy Crush Saga could make it hard for the name candy to be used as King.com recently filed a trademark for the word. In addition, the development team behind Minecraft are also looking into bringing this popular title to the next-gen Xbox One and PS4 as well as the PlayStation Vita, which brings us to a recent article where we discussed Minecraft PS4 being akin to the PC version. We documented how the developers are still ironing out bugs and they have their work cut out currently fixing various issues, but we could help joining the debate about how much better a next-gen console version would be in comparison to the current Xbox 360 and PS3 versions. While some enthusiasts believe the only way to play Minecraft is on the PC, this could be down to what has been seen of the current-gen console versions. We understand that the development team are focusing on fixes for the existing editions of the game, but we also feel that Minecraft on the next-gen consoles would be the nearest thing to the PC experience, which has been raved about. As gamers contemplate their wish list for Xbox One and PS4 versions of Minecraft an unlimited map like that on the PC would be welcomed, along with other things available on the PC. With this in mind, we thought it would be a good idea to highlight the Fansided website, in which a Reddit user has gone to the trouble of recreating a ‘full scale replica’ of the Metrodome. This Minecraft creation highlights the demolition of the Minnesota Vikings venue, which has been their home for over 30 years. 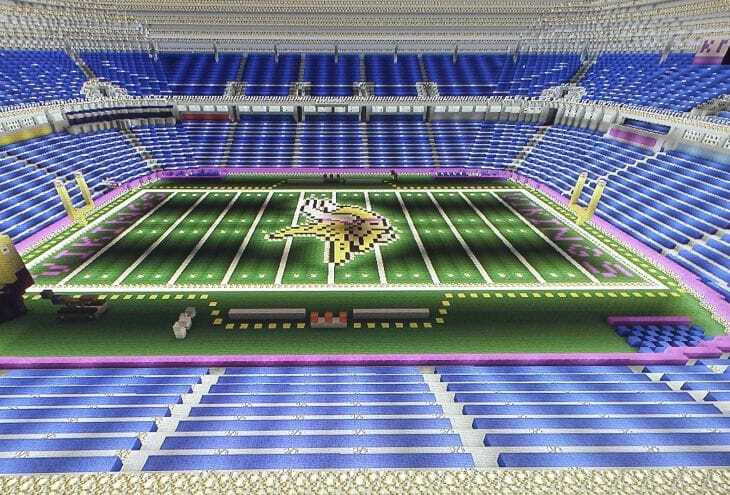 As we say goodbye to the Hubert H. Humphrey Metrodome and welcome the construction on a new one, fans can reconstruct this stadium with the use of Minecraft, as a Deflation Day Party marks this occasion by hosting a get-together at Hubert’s Sports Bar and Grill to commemorate this with 1982 prices. Returning to the original source, what other DLC would you like to see released for Xbox 360 and PS3 editions of Minecraft?